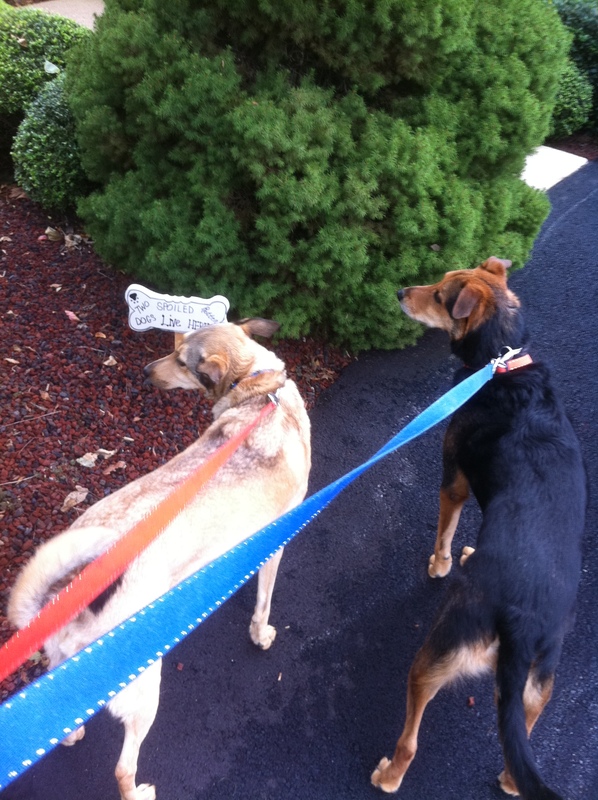 When I look back, I will see 2011 as a watershed year for me. It was a year when my entire life changed – for the better. I started the year in Memphis and ended it back home in Maryland – and in between drove 18,000 miles through 31 states in search of a drummer. I saw all 16 U2 360 shows in the US, discovered I wanted to write for a living, started my U2 blog, wrote my U2 tours memoir, tripled my twitter followers and most importantly moved back home. Although 2011 was consumed with U2, I did manage to squeeze in a few other activities. In January, I became a published writer, celebrated Elvis Presley’s 76th birthday, saw some Grizzlies games in style and started my On the Road with U2 blog. 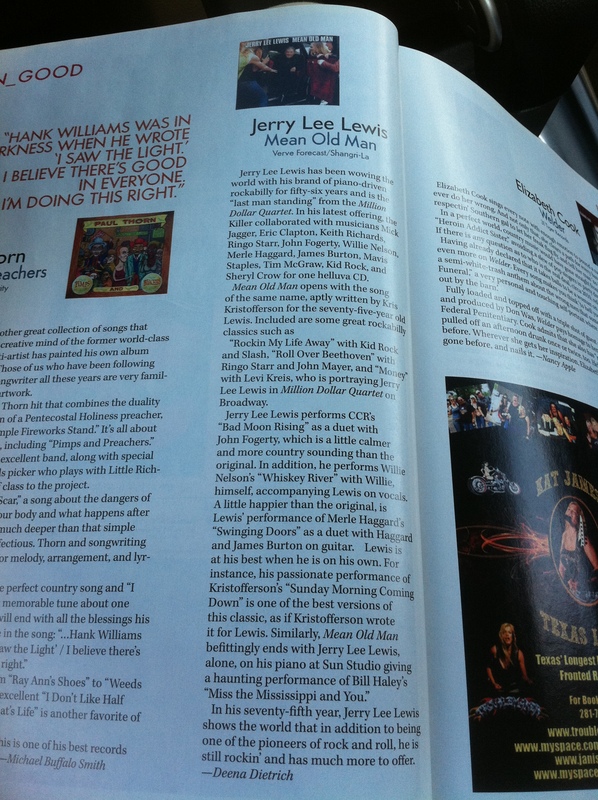 On January 7th, I scoured the book stores for a copy of the new Twisted South magazine because I had written a review of Jerry Lee Lewis’ cd Mean Old Man – my first (and only so far) published article. Later that same day I started Elvis’ 76th birthday celebration at his father Vernon’s house, where many Elvis fans gather to celebrate. It was my first visit to the house that backs up to Graceland. That night, I went to Graceland for the Elvis Insiders Reception and Tour. The next day, January 8th, was Elvis’ birthday. We celebrated on the front lawn of Graceland singing Elvis songs and ‘Happy Birthday.’ Chilean miner, Edison Pena wowed the fans with his rendition of Elvis’ Wonder of You. I had season tickets to the Memphis Grizzlies, but there were three special games – and they all occurred in January. On January 15th, I watched the Grizzlies game in style. About 25 of us who had $10 seats enjoyed the Grizzlies-Mavericks game from a suite, complete with food and drinks as well as visits by Grizzlies GM and VP Chris Wallace and Grizz himself. The Grizzlies defeated the Dallas Mavericks 89-70. It was Zack Randolph mini bobblehead night, and I received my autographed Zach Randolph jersey that I got for buying my season tickets early and paying for them at one time. Two days later was Martin Luther King Jr Day. I wore my U2 Pride MLK shirt to spend MLK Day with the Memphis Grizzlies at FedEx Forum. The Memphis Grizzlies were the first NBA team to have a MLK game – now everyone does. Prior to the game, I went to the Martin Luther King Jr Day Sports Legacy Award Symposium honoring NBA greats Willis Reed and Lenny Wilkens and MLB legend Willie Mays, who was such a character and very funny. Grizzlies lost to the Bulls 84-96, but the halftime show was great – the fantastic Mavis Staples performed! I spent the last day of January court-side at the Grizzlies-Wizards game. I asked for an upgrade and boy did I get it. I picked up my ticket at Will Call and it said $387. I was pretty excited because my entire season tickets cost $400. I was unsure where my seat was so I asked an usher, he looked at my ticket and said, “This is a $387. ticket! You’re on the floor.” I was dead center, court-side. I could hear the plays and see every expression on the players’ faces. The Grizzlies defeated the Wizards 107-93. I spent most of February planning my U2 360 trip and relaxing around the house reading and writing. I became very interested in Tennessee Williams. While reading his memoir, I discovered that he spent time in Memphis. Tennessee Williams spent the summer of 1934 at his grandparents’ house in Memphis recovering from an illness when he was in college. His grandparents, the Dakins, lived at 1917 Snowden Avenue, across from Southwestern University, which is now Rhodes College. While Tennessee Williams was in Memphis he had dinner at the Peabody Hotel restaurant, but spent most of his time in the library at Southwestern University, now Rhodes College, right down the street from his grandparents’ house. It was here where he wrote his first play Cairo, Shanghai, Bombay!, which was produced and performed by The Rose Arbor Players at 1780 Glenview in Memphis. 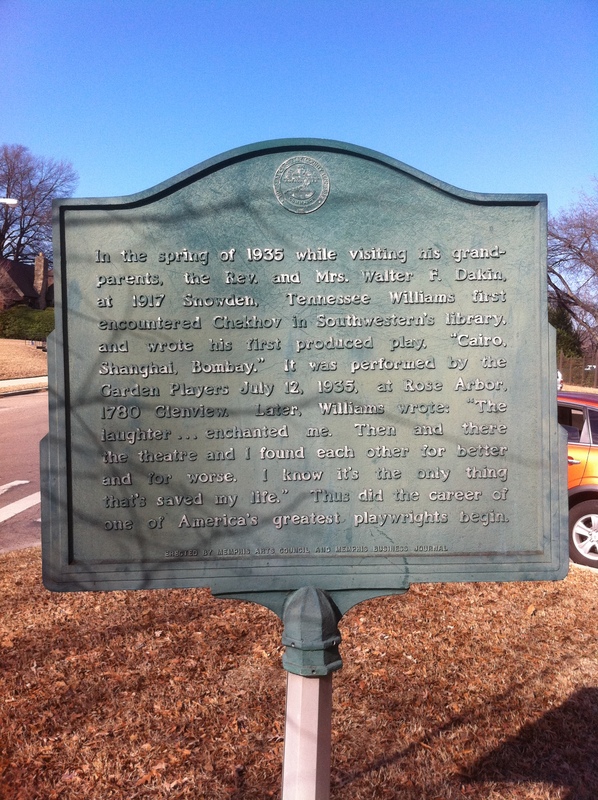 There is a historical marker at the corner of University and Snowden. In March, I celebrated St. Patrick’s Day at Murphy’s pub in Memphis with a girl U2 tribute band EweToo. I put on my U2 360 I’ll Go Crazy tee, drove a mile down the road to Murphy’s, got a Guinness and found a seat on the deck in the shade. I talked with a lot of great people, long time Memphians who all knew each other for years. Three Guinness later, EweToo finally took the stage. They weren’t really a U2 cover band. They learned U2 songs to play specifically for St. Patrick’s Day. They played Two Hearts, Sunday Bloody Sunday, New Year’s Day, Still Haven’t Found, I Will Follow, With or Without You, Pride and Desire. There were maybe two other U2 fans in the crowd, but mostly everyone was just singing the chorus and having fun. In April, I went to the Memphis Redbirds Opening Day and toured Graceland for what turned out to be the last time before I moved. For the third year in a row, I attended Opening Day for the Memphis Redbirds, the Triple A affiliate for the St. Louis Cardinals. For three years I sat in the front row behind homeplate. And for three years the stadium has never been full – even though it was 70s degrees, Opening Day and the Redbirds were the defending Conference Champions for the past two years. The game ended just before 11pm (4 hours!). Unfortunately, the Redbirds lost to the Redhawks of Oklahoma City 8-7. In May before I started my U2 360 Tour, I went to the Memphis in May Beale Street Music Festival as I had done the first weekend in May for the past nine years. My friend Tasha flew in early Friday morning for our annual weekend at the Beale Street Music Festival. We ate lunch at Paula Deen’s at Harrah’s Casino in Tunica, walked around the Art Galleries on South Main, and ate dinner at Majestic Grille. My first stop once inside MusicFest was the hat tent because I wanted to get a new cowboy hat. The prices were much lower than when I bought one a few years ago, so I bought another one. I would wear this hat to all 16 U2 shows. That first night of MusicFest we saw Everclear, Cake, Flaming Lips, Jimmy Vaughan, and Stone Temple Pilots. Saturday Tasha and I decided to go downtown early and walk around Beale Street before going to the festival. We had a great lunch at Alfred’s after a failed attempt at breakfast at Lil’ Anthony’s. The second day of MusicFest we camped out on the front rail of the Budweiser stage all day because Tasha wanted to see Mumford and Sons. We saw Amy Lavere, Paul Thorn, Jerry Lee Lewis (my annual favorite), and then finally Mumford and Sons – and Jake Gyllenhall who was watching from the side of the stage. Sunday we decided not to go to the Beale Street Music Festival because it was pouring rain. So instead we had lunch at the Cupboard and went to Sun Studio. We didn’t take the tour, as we could give the tour by now. We just sat in a booth and hung out for a bit, soaking in all the music history. This was to be my last visit to Sun Studio before I moved from Memphis. Monday morning we drove out east in the pouring rain to Blue Plate for breakfast before Tasha flew home. 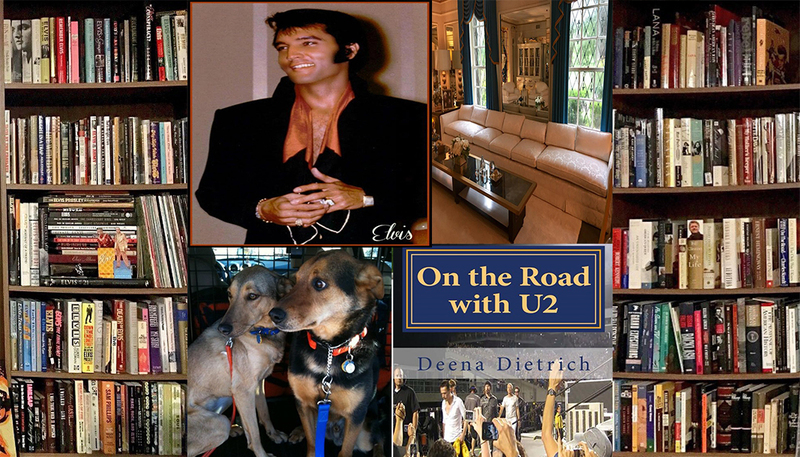 I spent the next three months On the Road with U2 driving over 18,000 miles with my dogs Elvis and Cilla through 31 states to all 16 US concerts, seeing many fantastic American sights along the way and making many great friends. This U2 360 tour was definitely the highlight of my year. I drove through and/or stayed in Tennessee, Arkansas, Missouri, Iowa, Nebraska, South Dakota, Wyoming, Colorado, Utah, Nevada, California, Oregon, Washington, Arizona, New Mexico, Texas, Oklahoma, Virginia, Maryland, Pennsylvania, Ohio, Michigan, Kentucky, Georgia, Florida, Indiana, Illinois, Wisconsin, Delaware, New Jersey and Minnesota. I visited Mount Rushmore, Crazy Horse, and Deadwood in South Dakota, Red Rocks in Denver, Temple Square in Salt Lake City, Reno and Lake Tahoe in Nevada, the Experience Music Project and Kurt Cobain’s house in Seattle, Fisherman’s Wharf in San Francisco, Harmony Hotel, Joshua Tree Park and Elvis’ homes in Palm Springs, took a bus tour of LA and Hollywood, visited Johnny Cash’s grave outside of Nashville, Bronz Fonz and Summerfest in Milwaukee, the Football Hall of Fame, and Soundgarden in Philadelphia. My favorite places I visited were Mount Rushmore, Palm Springs and Milwaukee. My favorite U2 concerts were Anaheim2, Chicago, St. Louis, Pittsburgh and Seattle. My favorite tour moments were seeing U2 walk through the crowd and onto the stage 16 times, “LET ME IN THE SOUND” during Get on Your Boots 16 times, Larry walking around during I’ll Go Crazy 16 times, being on the field at the Denver Broncos stadium for the first U2 show in the US, hearing Love Rescue Me for the first time in Salt Lake City, talking with Bono in Seattle, shaking Larry’s hand in Seattle, talking with Bono again in Oakland, hearing Larry sing Perfect Day in Oakland, hearing I Still Haven’t Found What I’m Looking For for the first time that leg in Anaheim, opening the show with five straight songs off Achtung Baby in Anaheim, Larry taking off his shirt on his way to the car in Baltimore, watching half of the show in the daylight in East Lansing, hearing Northstar for the first time in Miami, seeing Larry get out of his car at the stadium in Nashville, hearing The Wanderer for the first time in Nashville, Bono bringing a blind fan on stage to play All I Want is You to close the show in Nashville, shaking Edge’s hand in Chicago, finally hearing Out of Control for the first time that leg in Chicago, hearing One Tree Hill for the first time in Chicago, hearing the original version of Magnificent for the first time that leg, Bono’s shout out to me about the Larry Mullen Band in St. Louis, ending the show with Out of Control in New Jersey, the fantastic rain in Minneapolis, hearing Bad for the first time that leg in Pittsburgh, and my favorite moment of the entire tour (the entire three months) was when Larry hugged me on his way to the stage at the final US show in Pittsburgh. For all the details of my three months on the road with U2, including pictures and videos, please visit my other blog. After the U2 360 Tour ended on July 26, I spent a couple weeks at my parents’ house in Maryland before I drove back to Memphis for Elvis Week in August. Tuesday August 16th was the 34th anniversary of Elvis Presley’s death and his fans still remember. In fact, each year more and more fans flock to Memphis to pay their respects and remember the King of Rock n Roll. This was my 6th Elvis Week. I went to the 25th anniversary, then the 30th and then every one since. I began my Elvis Week with a screening of the documentary Sam Phillips: The Man Who Started Rock n Roll hosted by Knox Phillips and Peter Guralnick at the University of Memphis. After the documentary, Sam’s son Knox and author Peter Guralnick told stories about Sam and Elvis. It was a great documentary, a great couple of hours. Later that night I went downtown to the Orpheum Theatre for Elvis Presley Live: the King in Concert. Elvis’ conductor Joe Guercio introduced the show. When the curtain opened and the music started, the audience went wild. Elvis on stage, at least he looked as if he was on stage, with the band behind him. They used footage from Elvis ’69 performances in Las Vegas on a big screen that covered the entire stage top to bottom, but you could still see the live band behind it. I was so into the show that I forgot Elvis has been dead for 34 years and wasn’t really singing in front of me. From the screaming and cheering I heard, everyone in the audience agreed with me. At intermission The Imperials, the gospel quartet who toured with Elvis, performed a few songs. It was a great night, and the most fun event of Elvis Week for me. Elvis Week ends each year with a candlelight vigil at Graceland beginning the night of August 15th. Fans stand in line overnight and make the pilgrimage up the driveway to Elvis’ grave to pay their respects. I took my chair and cooler and secured a nice spot in the median on Elvis Presley Boulevard in front of the gates of Graceland. It was a beautiful night – cool for Memphis in August. It was great to be sitting in front of Graceland listening to Elvis music with people who love Elvis as much as I do. During the opening ceremony, everyone lit their candles and sang along with Elvis’ If I Can Dream– “there must be lights burning brighter somewhere…out there in the dark there’s a beckoning candle.” After the opening ceremony, I walked around a bit admiring everyone’s Elvis sidewalk art and sat back in my chair for a few hours enjoying the night. At 11pm, I got in line to make my way up the driveway. I passed through the gates of Graceland at 11:15 and was at the Meditation Garden by 1am. In September, I attended a preview of the remake of Footloose, saw the Denver Broncos play in Nashville, and decided to move back home to Maryland. Memphian Craig Brewer, who directed the remake of Footloose, put me on the guest list for its preview – we follow each other on Twitter. The large theatre at the Paradiso in Memphis was almost full for the sixth screening of Footloose. A lot of folks from the local news were in attendance and Craig Brewer was there to greet us as we arrived, introduce the film and sign posters after the screening. 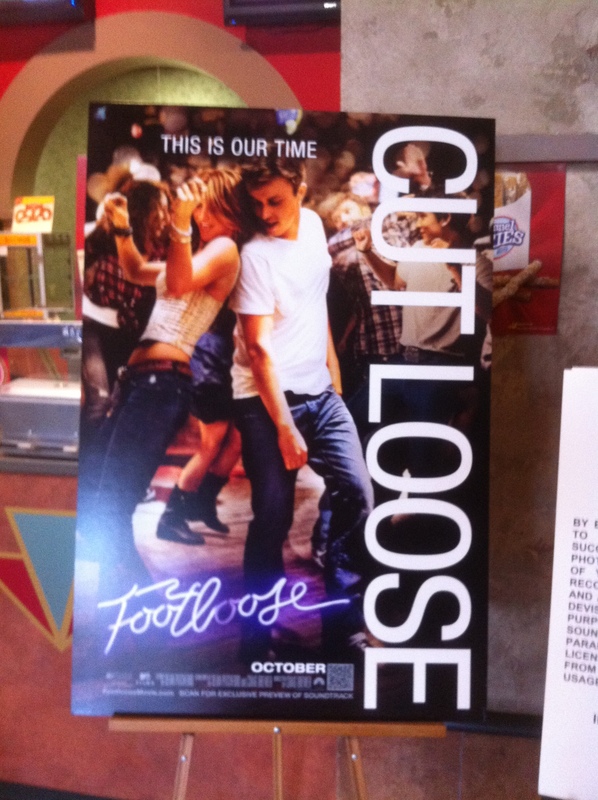 Craig explained he remade Footloose because as a 13 year-old kid in 1984 when it came out, it was as if the movie was made just for him. He was the misfit city kid who moved to the small rural town. The movie was fantastic! It was really funny and had an underdog champion kind of feel like Karate Kid and Rocky. The story and characters followed the original movie. Kenny Wormald’s Ren was way hotter than Kevin Bacon’s, but he did wear what looked like the same maroon blazer to the dance at the end of the movie. Dennis Quaid’s Rev. Moore was more sympathetic and less scary than John Lithgow’s. The music was great. It was a mix of covers of the original soundtrack and new songs. I drove to Nashville September 25th to cheer on my Denver Broncos against the Tennessee Titans at LP Field in Nashville, just as I had 51 weeks prior. Unfortunately unlike the previous year, my Broncos lost 14-17 to the Titans. It was still a great game though, mostly because I got to see John Elway. I saw him come out of the tunnel and ran toward him. I got halfway down the stairs when the usher stopped me because my seat was not down in front. I tried to explain to him that it was JOHN ELWAY and I love JOHN ELWAY, but he didn’t let me pass. He did, however, laugh at me as I screamed and squealed and shouted JOHN JOHN JOHN! I was shaking and SO excited. I’ve been to games and have seen John Elway play four times in his career, but I have never been that close to him. Unlike last year when I spent the entire weekend in Nashville (my birthday weekend), this year I just went to Nashville for the day. I couldn’t take the time off from packing for my move home or spend the money to stay in Nashville overnight. Plus my mom was flying into Nashville to help me pack and move, since Southwest doesn’t fly into Memphis. Mom texted me at the end of the 3rd quarter to say she had landed and was in a cab on her way to Big River Grille. Denver was leading 14-10 and the Titans fans were getting ugly, so I decided it was a good time to leave. I walked back across the bridge and met Mom. We had a nice lunch, and I got to see the last quarter on tv at the bar. Denver lost 17-14, so I didn’t miss much. We left Nashville at 4pm and were back in Memphis just after 7pm. The next few days Mom and I finished packing, played the slots at Harrah’s in Tunica (and of course ate at the delicious Paula Deen’s), and had one last traditional Memphis BBQ dinner at Central BBQ. In October, I moved back home to Maryland. More specifically back into the basement of my parents’ house in Ellicott City, Maryland. They are in Florida half of the year, so I have the whole house to myself, but I still stay in my basement apartment. Surprisingly, I love having all of my things in one room. I never thought I would leave Memphis and move back to Maryland, but something changed in me this summer. I decided it was more important to live where my family and friends are rather than live in a city I love. I love Memphis. I had a great time in Memphis. But it was time to come home. Mom and I left Memphis October 1st, we were back in Maryland October 2nd, got Ledo’s pizza on October 3rd, celebrated my 39th birthday on October 4th standing in our driveway directing the movers where to put my furniture and boxes, registered my car in Maryland and started unpacking October 5th, and Mom, Kathy and I went to Dover Downs Casino on October 6th – I won $1760. All and all a very productive week. 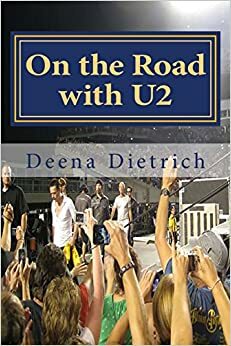 Since I moved back home, I have been writing my U2 Tours Memoir, hanging out with friends and family, reading, blogging, watching my Denver Broncos play, eating a lot of Ledo’s pizza, and looking for a job. I went to the Maryland Irish Festival with Abbey and Anisha to see U2 tribute band 2U play, went to Keira’s 5th birthday party, went to a Ravens game with my dad, had Thanksgiving dinner with the Knedeisen’s and my dad, went to Jilly’s with my dad and Shawn to watch football, saw The Muppets with Cindy, Tabitha and Keira, went to Charles Town Casino with Cindy and Kathy, babysat Tabitha and Keira, went to Dover Downs Casino with my mom, had our annual Trivia Christmas party, celebrated Christmas with my family, celebrated Cindy’s birthday with her family, and saw The Chipmunks with Cindy, Tabitha and Keira. 2011 was a great year because I moved back home, I discovered I love to write, I drove over 18,000 miles with my dogs across the country for three months visiting places I had always wanted to, made many great new friends, saw 16 great U2 shows, and Larry Mullen Jr hugged me on his way to the stage at the last US 360 show! I love posts like these… it’s cool to see how much you accomplished during 12 months’ time! I love that Jerry Lee is still playing Memphis in May. Can’t believe you won that much in a casino. Score! I came across your blog when I googled “Tim Tebow U2 fan.” Hah! Thanks Erin. Yes check out http://ontheroadwithu2.com for my U2 stuff and http://deenasdays.com for tim Tebow, the broncos and everything else.